Head on over to see more Events, Classes Teacher Directory, Shopping Opportunities, and Healing, Guides and Energy workers, Pampering sections! The weekends are busy, and life is hectic, but as long as we keep on dancing we’ll find those moments of peace! Here’s the latest news – read on! Fluidity and Slow Movements Workshop with Jalilah ALMOST FULL!! If you want to register please contact Julie at julie.tierneyATsympaticoDOTca first to make sure there is still a spot available for you. Jalilah will teach you how to move gracefully and to connect your arms, hip circles, infinity loops (figure 8s) and undulations together into a beautiful seamless flow. CALLING ALL DANCERS & DRUMMERS ! ! Coming up in just 2 weeks, on Sunday, May 2nd, is the annual Hike for Hospice, the major fundraiser for this worthy organization which provides loving support to persons diagnosed with terminal illness, their families & all those who care for them. For the past several years the Ottawa community of dancers & drummers have come out in large numbers to sing, dance, drum & encourage the walkers returning to the Hospice grounds at the end of their 5 km hike along the canal. The purpose is to provide a colourful, noisy & congratulatory welcome back spectacle for the hundreds of walking, jogging, strolling, cycling adults, kids, babystrollers, decorated family dogs & even folks in wheelchairs. The warm thank-you’s & appreciative comments we have received for our efforts in the past would have been enough, but the Hospice also provides us with a sumptuous picnic lunch & live entertainment in their glorious garden beside the Rideau River after the Hike. So, if you have participated in the past, or would like to lend your own dancing, zilling, drumming, clapping, cheering or zagareeting support with our group this year, please get in touch with me ASAP so I can reserve a lunch for you for Hike day. Husbands, kids, & interested bystanders welcome too. There will be a place for you to change into a costume if you wish, or you can arrive already dressed. Plan to arrive between 9:00 & 10 a.m. & park on a nearby street. The walkers assemble behind the Hospice building for speeches & opening ceremonies prior to setting out on the Hike at 9:30. See you at the Hike! 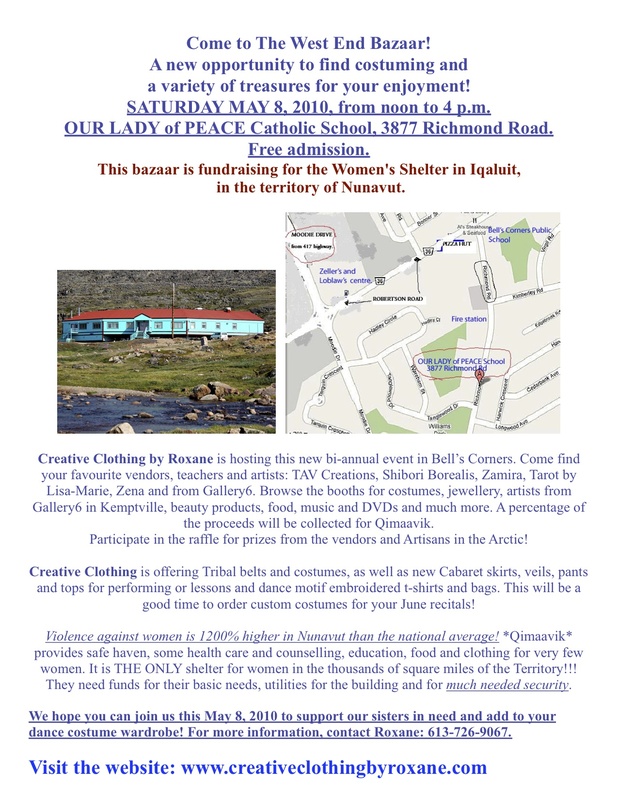 This is a bazaar fundraiser for the women’s shelter known as Qimaavik, in Iqaluit, Nunavut. These ladies need help for supplies, utilities and security at the only shelter in the entire Territory. TAV Creations and Eco-TAV: costumes and Eco-friendly bags! Sunday 3:30 to 4 p.m.
Join us for some dancing fun from the middle east to the colourful fields of India! Halyma and friends will wow you with their colourful costumes and joyful show – and join them to learn a few moves too! Whatever your interest, there will be something for you! Our talented teachers will offer you their very best as they share their knowledge and the rhythms of the Earth. Tribal fusion classes with Leslie – 8 week session – starts Tuesday April 20! This Tribal fusion Basics session will challenge both beginners and experienced dancers in a supportive environment. In this drill oriented class, you will learn the basic elements of this dance style, more advanced students will be asked to increase their speed and timing and practice layering. Some combinations will be taught near the end of the session. Registration is $100, space limited to ten participants! Drop-ins possible for $15/class, rsvp by email to confirm space is available.